At an early age, my family instilled knowledge of our roots and giving back to the community. When we outgrew clothes, or had a surplus of something we didn’t need, my mom always told us to “send it to the Philippines.” Like many Filipino families, we typically send items in “balikbayan boxes” (boxes sent by overseas Filipinos) every few months with items that range from basic necessities to treats they may not usually have. As we prepared for this trip, we prepared about 30 balikbayan boxes filled with basics (toothbrushes, toothpaste, clothing), food for the days we gave meals (spaghetti noodles and candy), medications and medical supplies from Americare and from the medical offices of my aunts and uncles who are physicians. 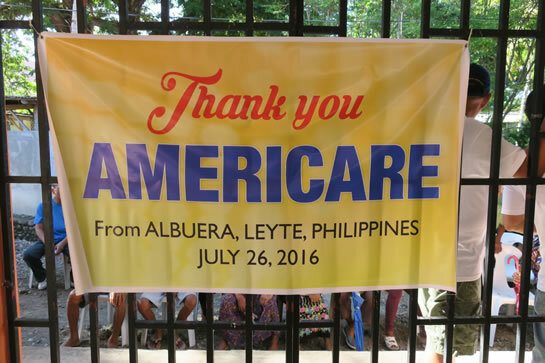 Americare sent medical supplies with the Barte family for their clinic. 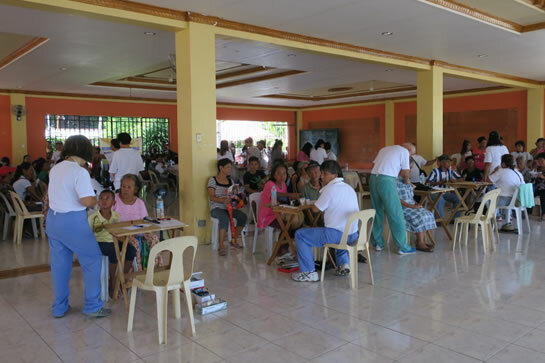 Many people gathered early inside of the St. James the Apostle’s parish hall for the clinic waiting to be seen. 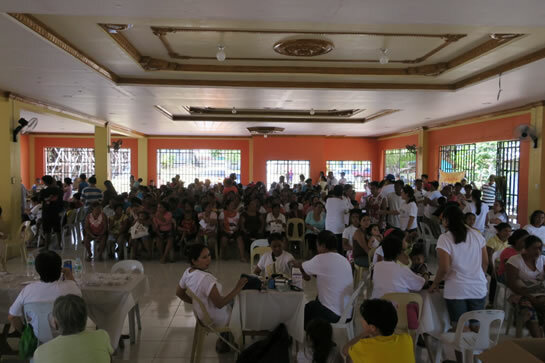 The day of the clinic, we anticipated to start at 8 a.m., but by 7:20 a.m., over 100 people were waiting. 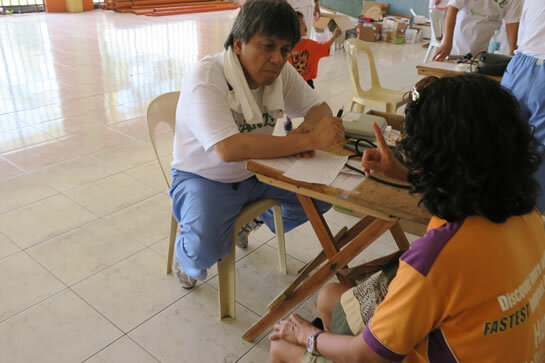 Patients checked in – providing their names, date of birth, town, and existing health issues. Patients had their blood pressure checked, and had the option to do a diabetes screening and receive reading glasses if needed. As patients waited, we passed out juice and snacks– some of which was purchased with a donation generously provided by the Alvarez Firm. 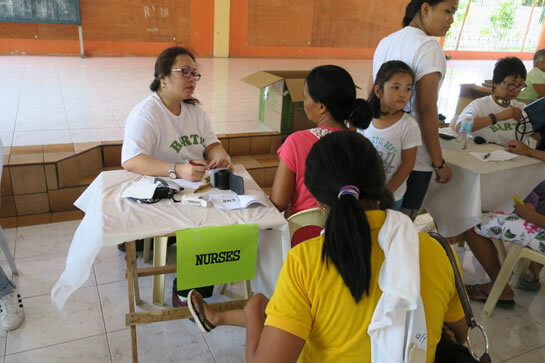 Patients had their blood pressures checked, a life-saving screening that is a rarity in Albuera. 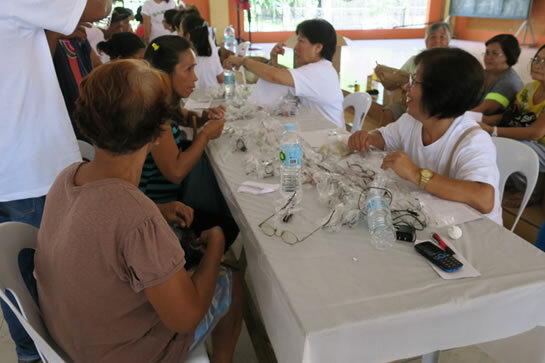 People of Albuera received much-needed reading glasses donated by members of the Barte family. Members of Tiffany’s family provided diabetes screenings. 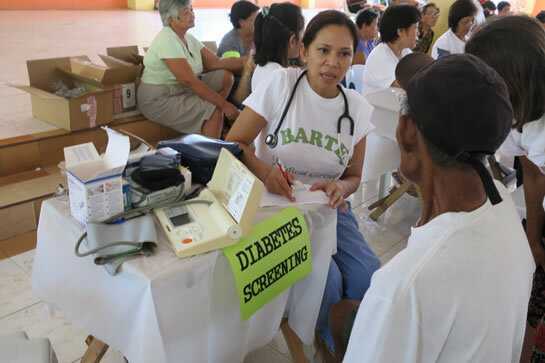 Diabetes screenings are crucial in preventing major repercussions of the disease. 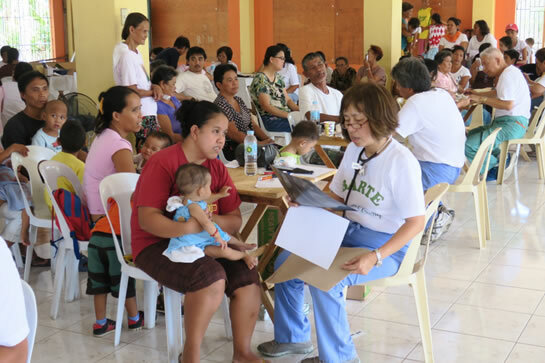 The people of Albuera saw one of the four doctors who volunteered for the clinic. For many, this was the only time for months or years that they would be able to see a doctor. After patients saw one of the four doctors, they were directed to our pharmacy to receive a month’s supply of multivitamins and medications we had. Some had cataracts and other possibly more serious health problems, but because we were short on our efforts to get a surgical team there, the doctors could only advise them to keep taking multivitamins since many could not afford to medical treatment. Many of the adults had high blood pressure, high cholesterol, and diabetes – much of which could have been prevented with education and treated with proper medical care. Most children were underweight and countless more had high fevers. We ran out of antibiotics and Tylenol quicker than we expected. One aunt told me she met a 9-month-old baby who was merely 10 pounds. Later, another aunt asked me to weigh a 1 ½ year old baby – who was shockingly only 10 pounds as well. The mother of this child, like many others, knew there was something wrong with her child but did not have money to be seen at the hospital. A young child sleeps on his mother’s lap as his younger sibling is checked by Dr. Martina Masongsong, who organized the Barte Medical Clinic. Dr. Armand Masongsong was one of the four doctors who saw over 500 patients that day. 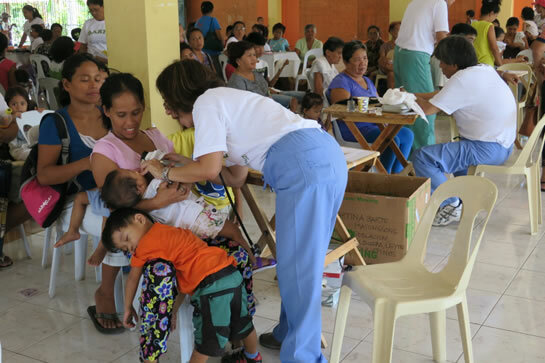 Many mothers who were not able to afford to bring their children to the hospital, brought their small children to the clinic to wait to be seen by one of the doctors. This child is one of three children who all needed antibiotics. He listened intently as one of Tiffany’s uncles spoke to his mother about how to give them the antibiotics. 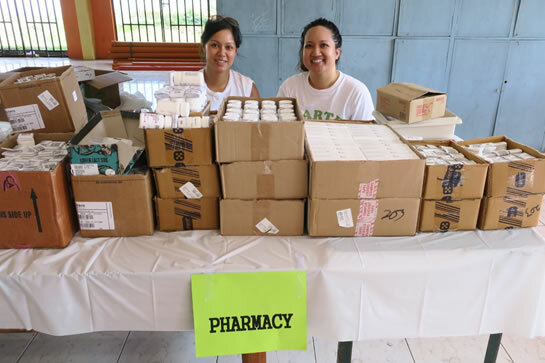 Tiffany Celedio (on the right) sits at the pharmacy table and helped dispense much needed antibiotics, multivitamins, Tylenol and other medications. The pharmacy table was the last stop for patients after seeing the doctors. Working at our pharmacy table allowed me to interact with many people. Many seemed intimidated to approach us but were quickly relieved when I spoke with them in their dialect. I met several people who shyly recognized me even though it had been years since my last visit. In one instance, my uncle pulled me aside to speak with a blind woman. He told her who my dad was and she instantly knew my name and my brother’s as well. Overall, we were fortunate enough to have had many members of our family involved in the medical field (nurses and doctors) who could participate. Other people contributed where they could – whether it was through translating, passing out snacks, or entertaining the children. By the end of our 12-hour day, we served about 500 people. In the meantime, my family continues to gather items to send via balikbayan boxes. If you would like to make a donation, we are collecting clothing and shoes (particularly sandals) for men, woman and children. These donations may be dropped off at either our Calabasas or Camarillo offices. 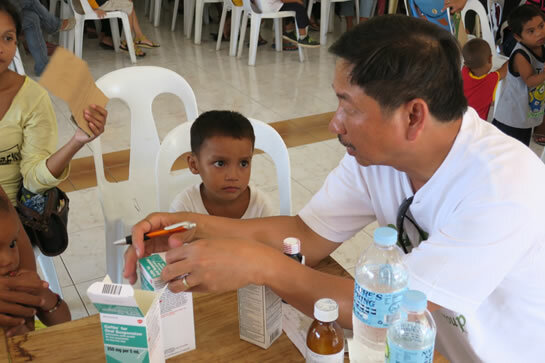 To make a monetary donation or for more information on non-profit organizations that do similar work as we did this summer, please visit http://www.doctorswithoutborders.org/country-region/philippines. 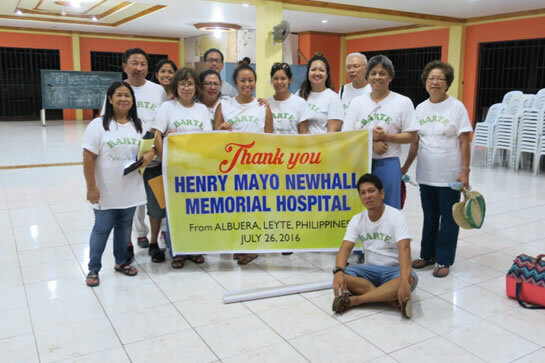 The Barte Family, some of whom work at the Henry Mayo Newhall Memorial Hospital, volunteered for the medical clinic in Albuera, Leyte in the Philippines. 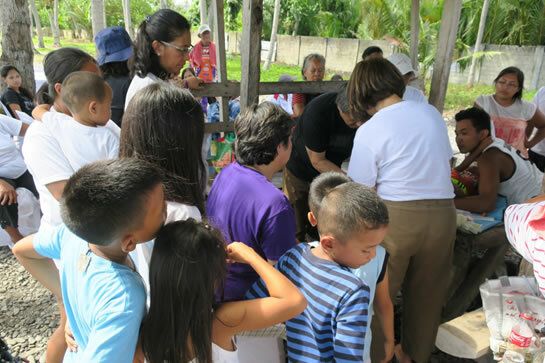 The following day, Dr. Armand Masongsong and Dr. Martina Masongsong, unexpectedly continued their service during a feeding of the local people. Many children watched closely as the doctors performed stitches on a little boy who stepped on glass along the beach.